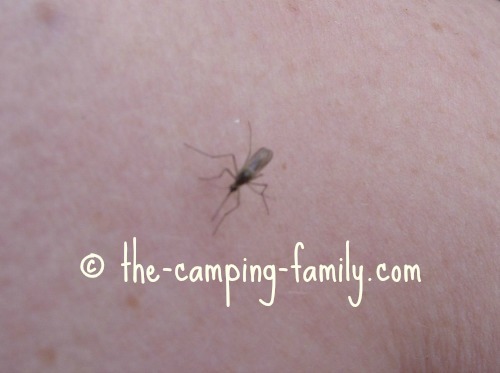 Mosquito bite prevention is an important camping skill! Nothing can take the enjoyment from an evening at camp quite like being swarmed and bitten by those annoying little creatures! Mosquito bites are always annoying and itchy. For those with a mosquito bite allergy, those symptoms can be even worse. And if that's not bad enough, diseases (like West Nile disease) can be spread by mosquitos. Avoiding mosquito bites is important! When I was a child, mosquito bite prevention was easy. We just doused ourselves with huge amounts of DEET-based mosquito repellent. I remember thoroughly soaking my skin and clothing with the stuff - and then spraying it into the air and walking through the cloud! And then someone realized that DEET is toxic, both to the environment and to those who use it. DEET based sprays and lotions are still available, and many people still choose to use them. You'll have to decide whether their benefits outweigh their potential risks. If you would prefer not to use potentially harmful chemicals on your family, you have to get creative. Fortunately, there are lots of mosquito bite prevention methods that are not dangerous. Just giving some thought to mosquito habits and behavior can help to avoid many bites. Mosquitoes breed in water. Before you choose a campsite, have a look around. Is there any standing water nearby? A stiff breeze can blow mosquitoes away. Try to choose a site that is not too sheltered from the wind. Mosquitoes seem to be attracted to dark colors. Wear light colors instead. These two photos were taken within seconds of one another. Look at all the mosquitoes on my husband's black jacket. At the very same time, in the same mosquito-infested location, there was not a single mosquito on my son's white shirt. Apparently mosquitoes are attracted to the scent of foods that are high in potassium - so avoid eating bananas if you are camped in an area with lots of mosquitoes. The potassium will actually seep through your skin and attract the critters! They also say that the scent of garlic repels mosquitoes. I haven't tried this so can't recommend it myself, but it couldn't hurt to eat a lot of garlic and see what happens! Mosquitoes are most active in the early evening. If you are camped in a really infested area, plan to be indoors (in your screen tent, in your tent or in your camper) at that time of day. It's a good time to get out the board games! You could also make a smoky campfire to keep the bugs away. You won't be able to avoid mosquitoes completely, no matter what you do. An important part of mosquito bite prevention is keeping mosquitoes away from your skin! Invest in a screen tent - and be sure to keep it fastened at all times. You'll be able to eat and play in peace. Learn what to look for in a screen tent here. 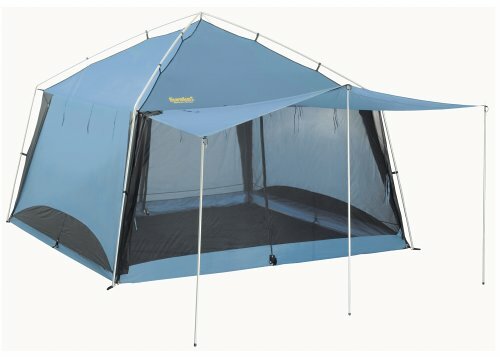 The Eureka Northern Breeze has all of the features that I'd want in a screen tent. It gets great reviews, too. Even on a hot day, you might want to wear long sleeves and long pants. I am a big fan of bug head nets. They are very effective, and are more comfortable than you might think! 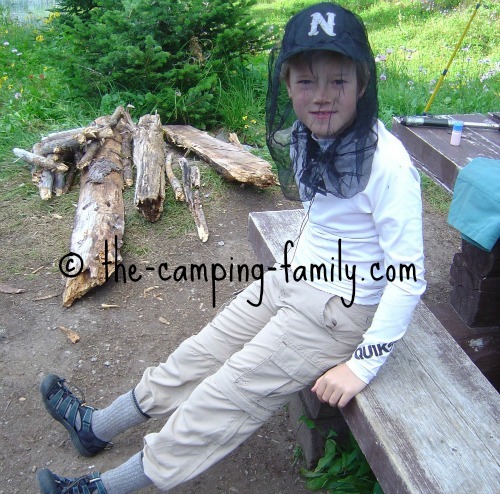 Our first experience with bug nets was on a backpacking trip to a cabin beside a lake. 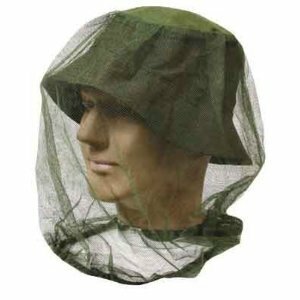 We had been warned that the mosquitoes were a problem, so we bought a bug head net for each member of the family. My children took one look and declared that they would never wear such a thing. Once evening fell and the mosquitoes appeared, though, they quickly changed their minds. To everyone's surprise, the nets were very comfortable. We wore them happily for the rest of the trip and strode fearlessly through swarms of mosquitoes. 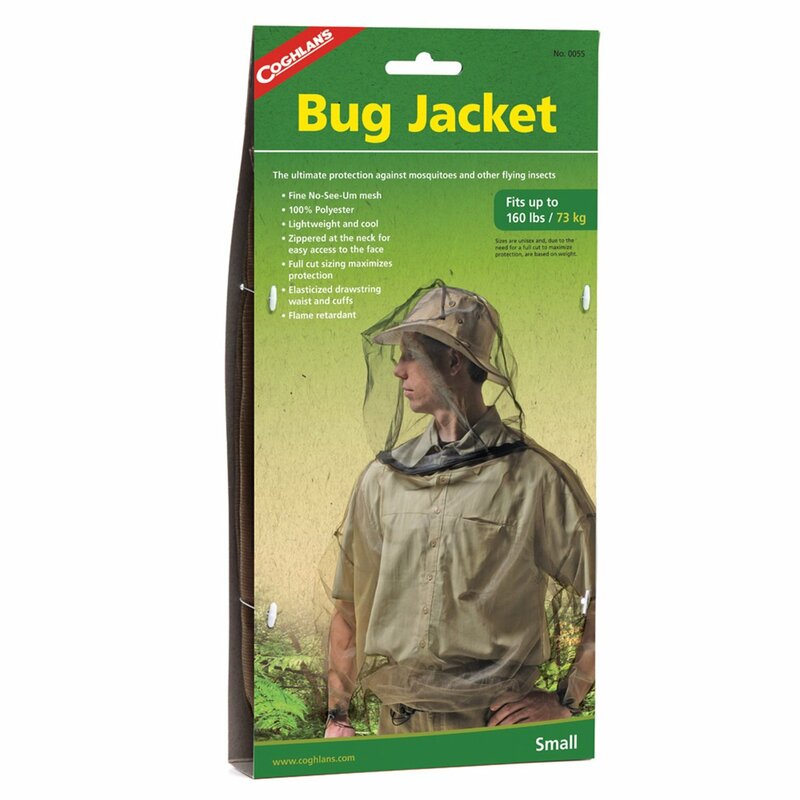 A bug jacket or a pair of bug pants gives you even more coverage than a head net! This is a newish innovation in mosquito bite prevention: clothing that is impregnated with a synthetic chemical called permethrin, which supposedly kills mosquitoes on contact. Apparently the chemical is not readily absorbed into skin and so is not hazardous to humans. 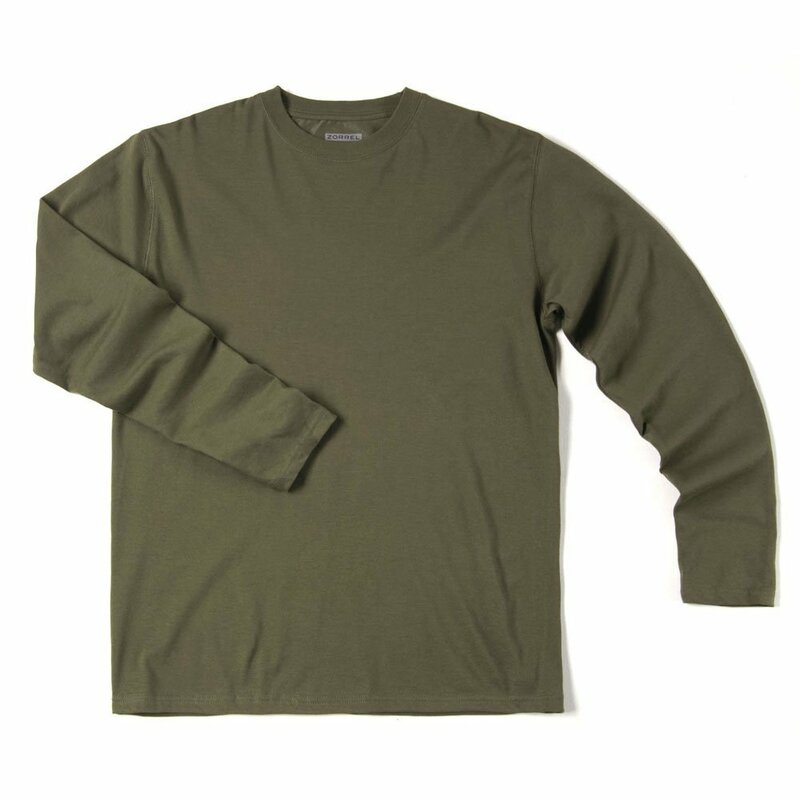 You can buy permethrin-treated shirts, pants, socks and bandanas. We bought a couple of mosquito repellent bandanas before venturing out on a camping trip one year. The bandanas looked and felt just like regular fabric bandanas. They didn't have an odor, and we didn't mind wearing them. We did get a few bites while wearing them. Would we have gotten more bites without them? I don't know. A more economical alternative to mosquito repellent clothing is to buy a bottle of permethrin and spray it on your clothing yourself. You can even spray your tent! One treatment with this spray is supposed to last for 6 weeks - or through 6 washings. There are lots of mosquito repellents on the market. The stuff I used as a child is still available. 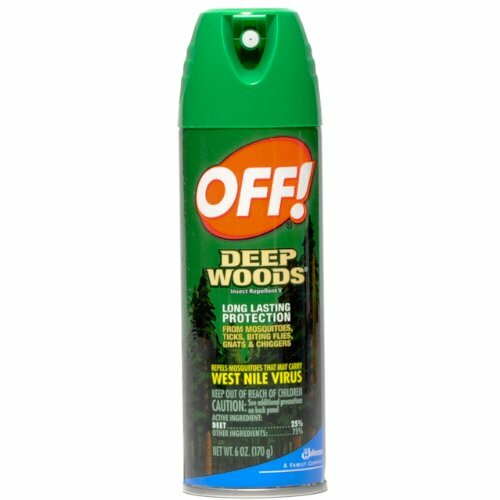 DEET repellent is available in spray, lotion and wipe form. Yes, absolutely. DEET keeps mosquitoes away. Probably not, if you can help it. Although many people (like me) have used DEET with no adverse effects, the medical literature includes lists of horrible side effects ranging from skin rashes to seizures to death. If you decide that the risks of using a DEET-based repellent are outweighed by the benefits of preventing mosquito bites, use the repellent as sparingly as possible. There are lots of varieties of natural mosquito repellents on the markets. Some are citronella-based. Others are made of a variety of plants and oils. 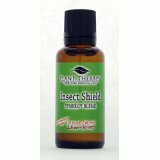 This repellent gets good reviews. It works for many people - and it smells nice! Maybe! Some are more effective than others. In general, their effects don't last as long as the effects of DEET. Why not? They won't do any harm, and might help. We have used a variety of natural products - and we usually get a few bites even so. Would we have gotten more without the product? I don't know. 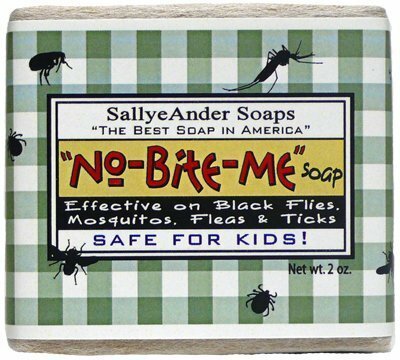 The label claims that this soap repels not only mosquitoes, but also black flies, fleas and ticks! The few people who wrote the reviews for this soap think that it does! Why not? Even if it doesn't work and you get bitten, at least you'll be clean! This blend of citronella, eucalyptus, cedarwood, lemongrass, lavender, litsea, tea tree, patchouli and catnip oils gets enthusiastic reviews from many users. Many people say that it does! As with all of the herbal solutions, why not? It can't hurt! 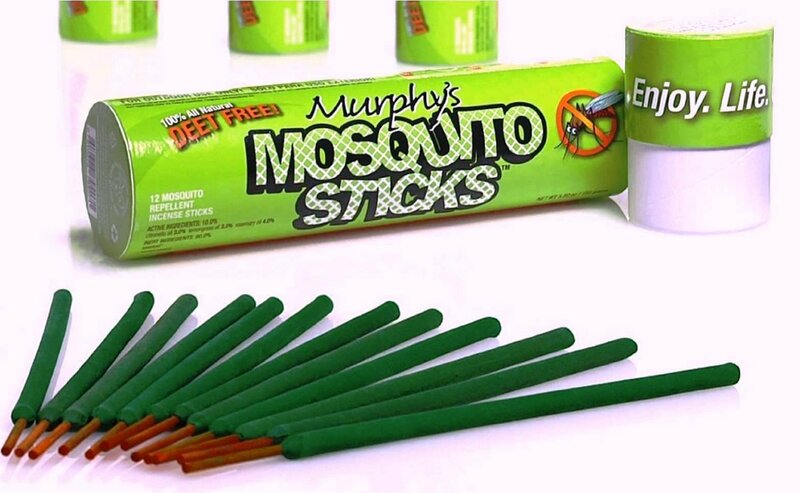 Light a few of these sticks, place them strategically around the campsite, and perhaps the bugs will flee! Maybe! The reviews are mixed. Don't get these if you are bothered by smoke - or if you are camping in a windy area. The wind will just blow the smoke away. Here is a newer alternative: a patch soaked in Vitamin B1. 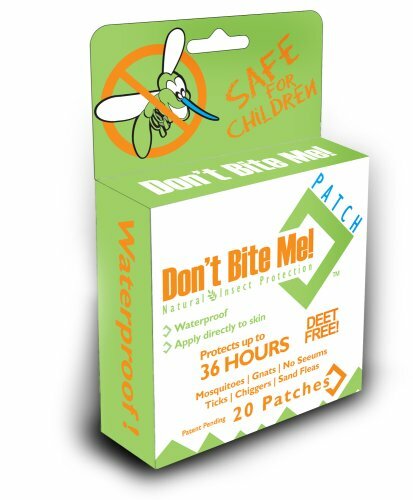 Apply the patch to your body several hours before you expect to encounter mosquitoes. The vitamin is absorbed into your skin and supposedly comes out your pores. Maybe, maybe not. I haven't been able to find any scientific studies that show that Vitamin B1 has any effect. 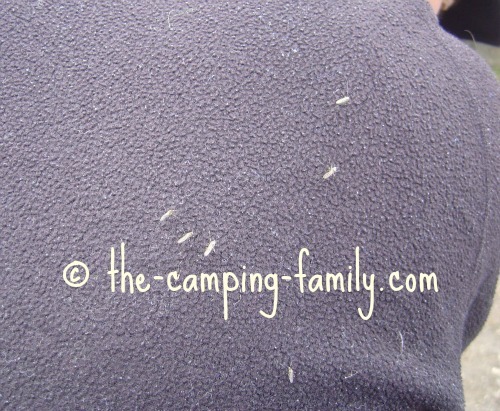 We tried these patches on an alpine hiking trip where the bugs were really bad. We were bitten, a lot. Would we have gotten even more bites without the patches? I don't know! Once you have decided on your mosquito bite prevention strategy, be sure to put your mosquito gear on your camping list! 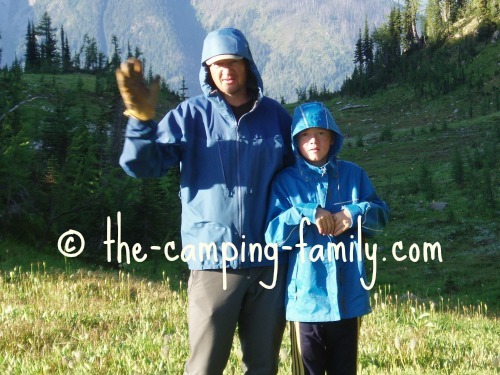 Here are my husband and son on a backpacking trip. They didn't remember to bring any mosquito protection, and the mosquitoes were horrendous! These two guys spent most of the trip either huddled in the tent, or bundled in their raincoats. They were hot and uncomfortable! They'll never forget their bug gear again! Try to avoid the places where mosquitoes hang out. Use clothing and other barriers to keep mosquitoes from biting. Use DEET - if you use it at all - only as a last resort. Now that you know all about mosquito bite prevention, click here to learn about other camping safety procedures. 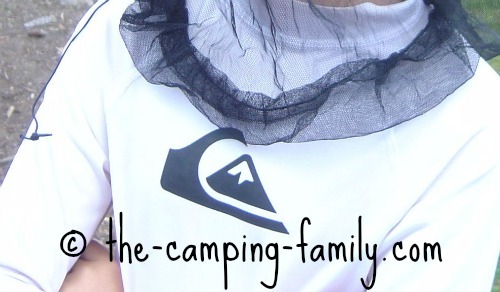 Visit The Camping Family home page for ideas about every part of your next camping trip.